Ladies motorcycle clothing can be beautifully designed as well as being able to keep the wearers safe if there is an accident. The insulating jackets can also protect from the elements, road rash, and debris. You can choose from different styles, materials, and colors, and find the clothing that fits your unique and particular style, looks amazing, and is fashionable. The premium milled cowhide is drum dyed so that the color goes all the way through. The jacket is vented in order to supply a maximum airflow that will keep you cool. The 3M Thinsulate liner is full-sleeved and removable so that it can be adjusted to temperature changes. Adjustable side zippers provide comfort when riding. This has an asymmetrical zip front, a snap down collar and lapel, belted tabs on the sides, a zipper on each sleeve, a stitched pattern on the elbows, a vented zipper chest pocket, and two zippered lower pockets. Made of premium distressed top-grain cowhide leather, there are zippered vents both front and rear, two zippered hand pockets in the front, a full-sleeve zip-out liner with a hoodie, and the added feature of two inside concealed weapon gun pockets. Nearly 1.5 times thicker than a standard jean, this machine-washable 14.5-ounce denim will excel in the toughest motorcycle environments. Kevlar is as strong as steel yet is as flexible as a fabric. Abrasion protection of your backside is provided by a Kevlar patch that extends across the entire seat and from the belt loop to just below the behind. To protect from knee abrasion, a Kevlar patch extends from the mid shin to above the knee from seam to seam. Eagle Leather is an excellent example of a company that is the largest motorcycle gear retailer in the Pacific Northwest. 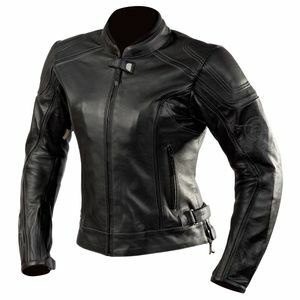 They are proud of being able to offer a wide selection of motorcycle clothing from the top brands in the biker gear industry and including their own Eagle brand.